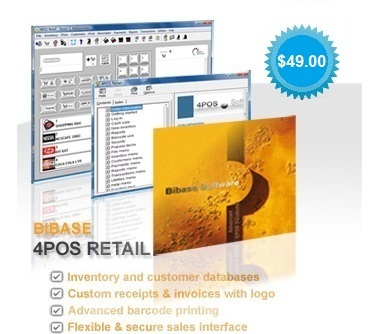 4POS Retail is the right answer for any small or mid size business that needs to do retail sales. It is a general point of sale application for retail outlets that has been specifically designed for ease of use, (mostly one click operations). Just input your stock and use it to process sales, track inventory, print receipts, invoices and barcodes. It is straightforward for your staff and you have a business overview at a glance. The trial download is a compact Microsoft installer file about 1MB. It does not require registration or install any advertising components such as toolbars. Great value with features normally associated with far more expensive software. Built in inventory, customers and supplier databases. Unique secure sales interface that staff will be able to use in minutes. Suitable for general retail, Take away, Sports and Trade counters. Professional looking invoices, receipts and delivery notes, just enter store details and logo once. Toggle button to switch between retail and trade pricing. A wide variety of single click reports are available. The F12 key pulls up an overview of the most useful information. The program can also produce sales summaries, restock lists and comprehensive logs of all transactions. There are four selectable languages built in, additionally almost any of the wording may be overidden to allow the use of other languages or phrasing. $49.00 Includes CD and shipping. $64.00 Includes printed manual, media and shipping. To allow evaluation the trial has almost all of the features of the full program but with curtailed memory allocation routines for limited inventory. The capacity of the full version is 200000 inventory / customers. Display 800 by 600 (1024 by 768 or more recommended). No, please see our server version, 4-Shop SC for that facility. A second currency may be displayed and also printed on the custom receipts. The program supports wedge and USB barcode readers and will print both most commonly used Code 39 and EAN (UPC-A) barcodes on a variety of labels.